Move over Bengals, hit the showers Mr. Red Legs…there’s a new sheriff in town! The Cincinnati Rollergirls (CRG) are back in action for their sixth year of thrills and spills on the track. Our family has been a loyal fan base since we were introduced to it by the lovely Miss Print last year. It is simply a great time! The sport is fun and fast paced. Don’t know the rules? No worries – just cheer when everyone else does! I love taking P to something so full of GIRL-POWER! Three-thousand plus fans screaming and cheering on WOMEN! She thinks they are all ROCK STARS and I consider it a plus to my parenting! 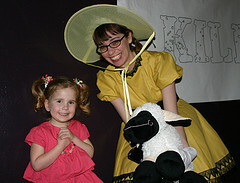 The Rollergirls consist of two teams: A Team known as The BLACK SHEEP and B Team known as The SILENT LAMBS. At each home match up, both squads will compete – there is an intermission and usually a HALF TIME SHOW in between. CRG competes as part of the WFTDA – the Women’s Flat Track Derby Association. The team is owned and operated by the skaters. At the start of the season, CRG was ranked in the top 25 of the more than 350 teams in North America – they are ranked 19 nationwide currently – 4th in their division. Believe me, this is serious business. The competition is fierce and the skaters play hard, but it never turns nasty and sportsmanship is always in play. During the matches, there is plenty of family friendly fun to check out – they have a terrific balloon animal artist (you can find him near the merchandise table on the floor). 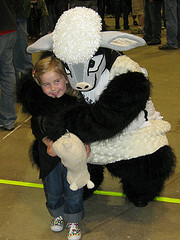 Two “Little Bo Peeps” who are just delightful – and new this year is the WORLD’S MOST AWESOME MASCOT EVER: Wooly Bully. He’s quite the charmer and P is absolutely smitten. At the end of the night, the crowd is invited to descend onto the track for autographs, pictures…plenty of fan face time with the entire team! P loves getting her picture taken with everyone – even the opposition! Tickets are quite reasonable: $10 for adults; kids 7-12 are $5; and kids six and under are FREE! Parking is FREE! Doors open at 6pm and first match is at 7pm. Tickets are available through Ticketmaster, but I believe you can walk up as well on game days. They have food and beverages available, but we bring in snacks and juice for P to keep the conce$$ion stand runs to a minimum. True Hollywood Story: I usually cave and have to get a Chick-fil-a for $4 . What is it about those yummy chicken sandwiches that weaken my defenses so? THIS SATURDAY (5/8) vs. Chicago – This is SCOUT NIGHT. There is special ticket pricing for Scouts which includes a private meet & greet with the skaters and a commemorative patch. More details can be found here. 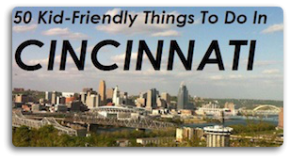 You can follow them on Twitter @cincyrollergirl; fan them on Facebook; catch their latest commercial over at YouTube; and of course check out all the must-know insider stuff at their site. My family will be there with bells on Saturday! So what are you waiting for? Grab some tickets and let’s roll! I have a question… is it violent? I guess I just don’t understand enough about it ask educated questions, but I wonder are girls punching one another, tripping, etc., like I see in the movies, etc? .-= tela´s last blog ..Friday Finds – May 7, 2010 =-. Thanks so much for the great write-up! I remember your daughter, she was all over the place! So cute! YES Jerry will get you to the purple couch & make sure you’re taken care of! Great post covering all aspects. I did find the explanation inside the program to be helpful for those who really get into knowing how these matches/bouts work. Hope to see many at the CWB tailgate May 29! Can’t wait to see them in action on May 29. Looks like so much fun. .-= Kristin ´s last blog ..Breaking Up Is Hard To Do! =-.